Altevir® has antiviral, immunomodulating, antiproliferative and antitumor effects. 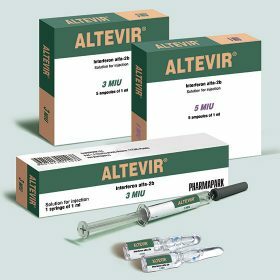 Altevir indications include chronic viral hepatitis C (as part of combined therapy), laryngeal papillomatosis, pointed condyllomas, hairy-cell leukosis, non-Hodgkin lymphoma, melanoma, multiple myeloma, AIDS-associated Kaposi’s sarcoma, advanced renal cancer. Solution for injection, 1 MIU, 3 MIU, 5 MIU or 10 MIU 1 mL in ampoules; 3 MIU 1 mL in prefilled syringes. Recombinant human interferon alfa-2b, sodium acetate, sodium chloride, disodium edentate, polysorbate 80, dextran 40 (10% solution for infusion), water for injection. The information on pharmaceutical products presented in this site is intended for healthcare professionals; it should not be used for self-diagnostics or self-medication and does not eliminate the need for consulting your physician.